Adopt the role of a terrorist as you walk through the city en route to an interrogation in a hidden room. 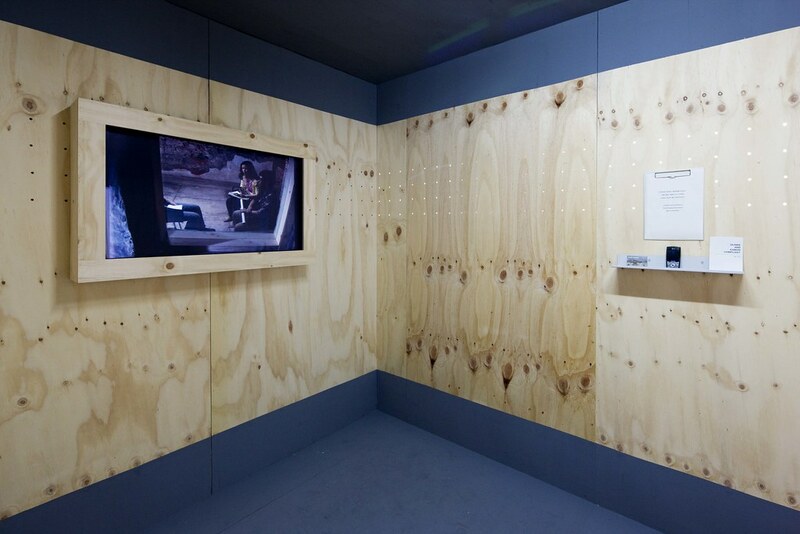 Commissioned by the De La Warr Pavilion for the Venice Biennale Ulrike And Eamon Compliant places each participant at the centre of a world of bank robbings, assassinations and betrayals. 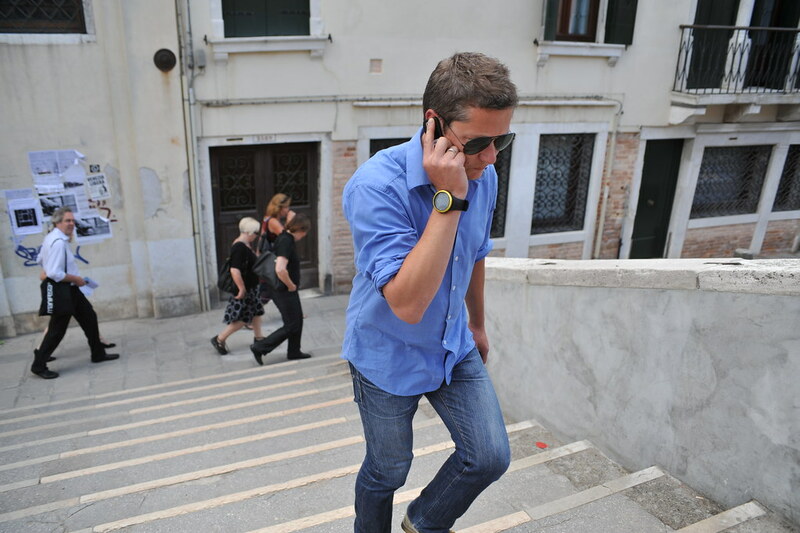 Assume the role of Ulrike or Eamon and make a walk through the city while receiving phone calls. 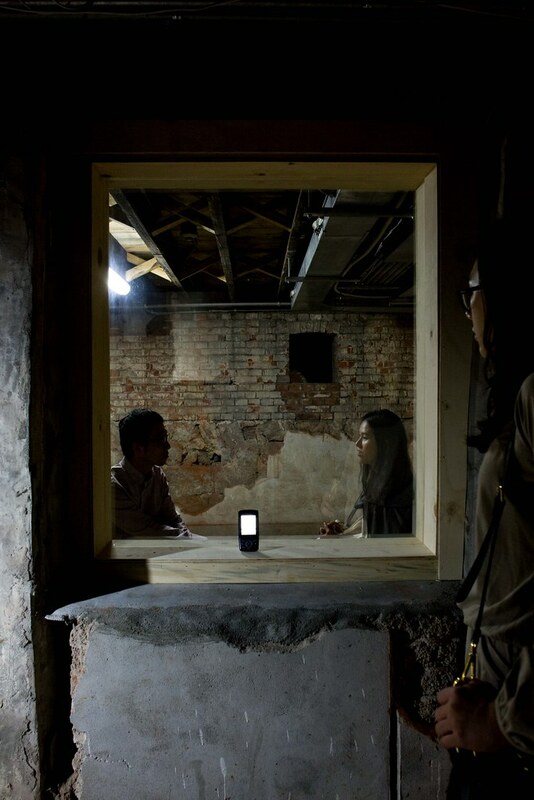 The project is based on real world events and is an explicit engagement with political questions. What are our obligations to act on our political beliefs? And what are the consequences of taking those actions? The work starts in Palazzo Zenobio where you enter a wooden room, which has air holes drilled into it, and pick up a mobile phone. There is a screen on the wall showing video of an interview – the interview is live and you can faintly hear the conversation the two people are having. To begin you press dial on the phone: on the screen a phone starts to flash. A person walks into shot and answers it, telling you to put on a pair of sunglasses. 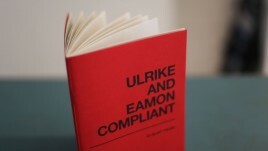 They ask you whether you would like to be Ulrike or Eamon. They tell you to leave the gallery and walk outside. They guide you onto a bridge and then hang up. Over the next thirty minutes you receive a number of phone calls that lead you through the city, engaging you as either Ulrike or Eamon and prompting interactions. One call invites you to nod your head and to say whether you are a decisive or a hesitant person. You walk off the bridge past the pharmacy and onto the next bridge. When instructed to do so you raise your hand to your head; then choose a passing stranger and give them a name. You are guided from the second bridge, alongside the canal to the tatty grass area in front of the barracks. Once you lay your sunglasses on the bench, the next call asks you what you can do for the people around you. Your route leads past the high red wall of the barracks into tight graffiti covered alleys and out into the expanse of the square. You wait by the well before heading to the water’s edge to make your decision on whether to hang up and head home or to stay on the line and go to the room where questions get asked. If you go on, you are led to the final bridge and from there to the dead end alley where an interviewer is waiting in the distance. You are then led out of a hidden door at the far end of the room, around the back of the mirror, where it becomes clear that it is a two-way mirror. 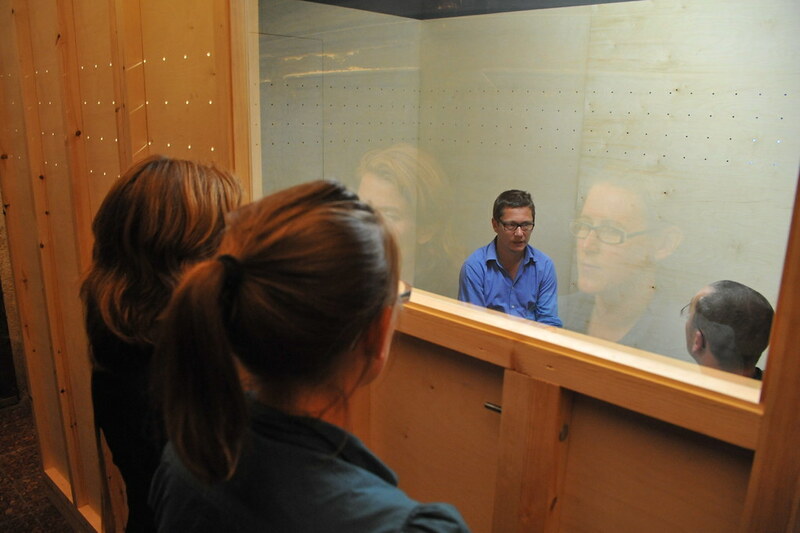 You are invited to wait for a while to watch as the next person comes in and sits down to be interviewed. 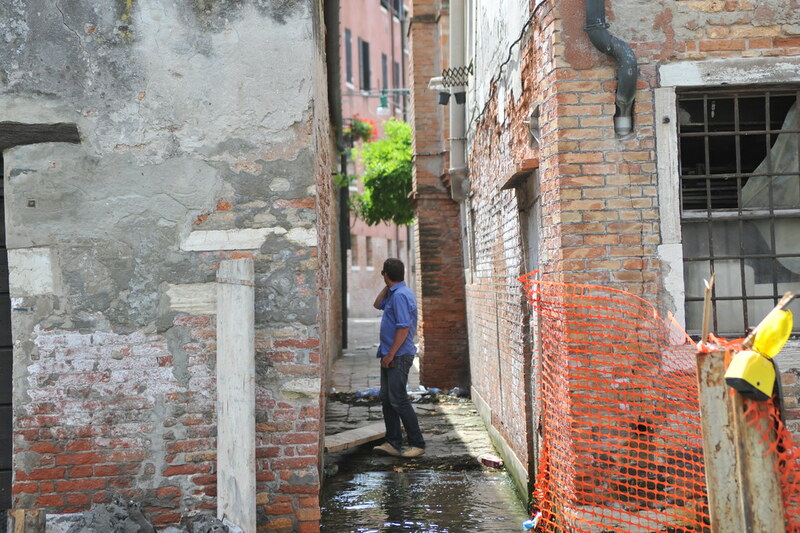 Then you step back into the alley outside the church. This last decade, terrorism has been viewed through the prism of Islam, Manichean certainties, racial and linguistic divides. For Ju, Nick and I it seemed a good moment to revisit home grown terrorists who cannot be so easily distanced and whose legacy has recently become clearer. The Red Army Faction only officially dissolved in 1998, the same year as the Good Friday Agreement in Northern Ireland. Reading The Killing Rage by Eamon Collins I was struck by his fastidious attention to, and engagement with, the political landscape. He was no knee-jerk republican. His journey towards violence took many years. From 1968 onwards the deterioration in Northern Ireland was stark and relentless: Eamon’s first victim was Major Ivan Toombs in 1981. For Ulrike Meinhof the key milestones towards violence are even clearer to see in retrospect: the point blank shooting of the peaceful demonstrator Benno Ohnesorg in 1967, the attempted assassination of radical leader Rudi Dutschke (Ulrike was nearby on both occasions), the coalition between the SPD and the CDU and the relentless conservatism of the Springer press. Combined with the global context of the Vietnam war and the personal context of her divorce it is possible to see a rational progression towards her joining Andreas Baader and Gudrun Ensslin. If we are to allow that these two may have acted sensibly, that their ultimate moral corruption may have begun nobly then it raises the question of how close each of us may be to them. Recent research in moral philosophy has produced some evidence showing that we behave much more uniformly in given situations than previously thought. Kwame Antony Appiah’s book Experiments in Ethics considers in detail the practical application of moral challenges in the real world. Given our decision to structure Ulrike and Eamon Compliant with an interview as its climax we felt that there was an opportunity to challenge each participant with some of the implications of these questions. A trolley is running out of control down a track. In its path are five people. Fortunately, you can flip a switch, which will lead the trolley down a different track to safety. Unfortunately, there is a single person tied to that track. Should you flip the switch? Devised by philosopher Philippa Foot in the 1960s this problem helps elucidate subtle but crucial distinctions in our moral decision making. For example, should we actively kill someone in order to save five others? The transcripts of the trial at Stammheim of the Red Arny Faction leaders in which they relentlessly argued that their murder of dozens in West Germany should be weighed against the murder of tens of thousands in Vietnam show that this is not just a moral question. At one level their struggle – and that of the IRA prisoners on hunger strike fighting for political status – is one of jurisprudence: what are the norms and bounds of fairness and justice? The full version of this statement is included in the book Ulrike And Eamon Compliant available from our shop. The 48 page book includes the full script of the work, colour photos, a foreword by Alan Haydon and the essay Undercover Agencies by Richard Grayson. A DVD is also available. Ulrike And Eamon Compliant has also been shown at TRUST: Media City in Seoul, DocFest in Sheffield, the Nottingham European Arts and Theatre Festival (at Nottingham Playhouse) and at the Politics in Independent Theatre festival in Dresden. Ulrike Meinhof (1934 – 1976) was a German journalist who became notorious through her membership of the Red Army Faction. Her fraught relationship with fellow members Andreas Baader and Gudrun Ensslin may have contributed to her suicide while awaiting trial in prison in 1976. Eamon Collins ( 1954 – 1999) was an active member of the IRA’s Nutting Squad, in charge of internal security, before becoming an informer on whose evidence large numbers of the IRA were prosecuted. He was murdered in 1999. It was made possible by the generous support of Arts Council England and Turning Point South East and with the cooperation of Nuova Icona and Oratorio di San Ludovico. Review, New York Times, 2009, (PDF). 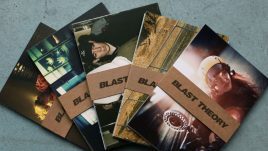 Review, 10 Magazine, 2010, (PDF). Review, 20Three Blog, 2009, (PDF). 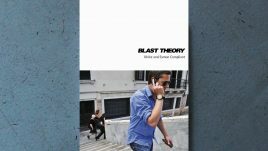 Ulrike and Eamon Compliant is my favourite Blast Theory work, to me it seems to be a culmination of the themes of all the work that came before it. It’s quite sneaky in the way it draws you in, what feels like a biography quickly spreads in your mind as you are moved from location to location; your sense of direction is undermined along with your preconceptions of what you are hearing. The work sets you up perfectly and then knocks you down as the switch from cultural voyeurism to personal responsibility is dropped into your lap.